Many history books written in the twentieth century inherited from the nineteenth century the notion that different races evolved along incommensurate paths determined by their national “essence.” Such a notion was foreign to most eighteenth-century thinkers, who would not hesitate to compare, for example, Chinese taxation with European taxation. The nineteenth-century prejudice lives on even today when people claim that you cannot compare, for example, “Western” concepts of art with “Asian” concepts of art. Such a claim suggests that the two evolved along completely separate paths, but we can see that this was not the case. Since the sixteenth century, China and Europe have been in constant contact. Because of the invention of printing in China and world exploration by Europeans, contact and exchange among different parts of the world increased. As different nations learned more about one another, jealousies and rivalries flourished, with each trying to outdo each other. In the process, many inventions and ideas were adopted, adapted, and developed on both sides of the Eurasian continent. Gardening and prints of gardens were important means of shaping international attitudes toward a nation in the eighteenth century; therefore, it played such a prominent role in the history of that period is not surprising. If we look at the destruction of the Garden of Perfect Enlightenment in the context of cultural competition, it is easier to understand its destruction as a product of international dynamics. In the mid-eighteenth century, Attiret had said that European monarchs had nothing comparable to the Garden of Perfect Enlightenment. This must have enraged many Europeans, who regarded their own civilization as greater than all others, but this garden remained the symbol of China’s cultural brilliance. As late as the 1770s, many progressive European intellectuals continued to admire China for its religious tolerance, secular morality, and relative social equality. 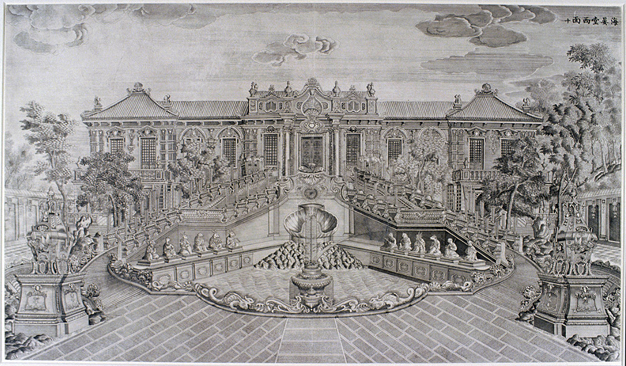 By the end of the eighteenth century, the “irregular garden” reigned supreme in Europe, and the French garden theorist Abbe DeLille still recognized the Chinese as the inventors of the “irregular garden.” But, for the British, their major claim to fame in the cultural arena was the invention of the irregular garden! And so, during the last decades of the eighteenth century, European writers increasingly began to deny that Europe had learned anything from China. As economic and political tensions between the Chinese and British empires mounted in the mid-nineteenth century, is it entirely accidental that the British troops chose to vent their wrath on the Garden of Perfect Enlightenment, the symbol of China’s culture of originality and naturalness? Did they hope perhaps to erase the memory of Europe’s debt to China? The European Pavilions, like the Kew Gardens, reflect the shrinking world of the time. They also demonstrate that increasing contacts among different cultural practices can lead to the development of ideas and institutions previously unknown. This is evident in the transformation of perspective on both sides of Eurasia. European perspective implies a single, “controlling gaze” that defines what is true against what is false. Its conformity to the laws of optics stands as its claim to universal validity. The multiple perspectives offered in Chinese gardens and paintings openly acknowledge the subjective nature of “views,” and celebrate it as such. In Yi Lantai’s engraving of the Hall of Calm Seas, we see a wonderful negotiation of these two “views” of viewing, one which celebrates the ingenuity of European science even while acknowledging the subjectivity of perspective. Hall of the Calm Seas. On the other hand, in the English and French “irregular” garden, the singular orthodoxy of traditional perspective had been abandoned, but the size, grandeur, and bucolic air of these gardens make use of ideals peculiar to Europe, which did not exist in China. 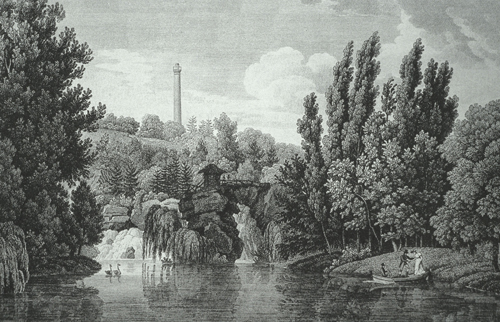 The Grand Cascade at the French garden of Méréville with its “artificial” rocks, weeping willows, extensive waters, and other design features associated with Chinese gardens in the eighteenth century. Nouveaux Jardins de la France et ses Anciens Chateaux, 1808. From all this we can see that, when we say that developments in culture are transcultural, it does not suggest that two different traditions have simply been amalgamated. Actually, we need to understand the dynamic energizing international encounters—the competition, the struggle for national supremacy, the sour grapes, exaggeration, demonization, and accommodation. Then we can identify what was at stake and better understand the actions that were taken.